Note: This is a shorter version of a piece appearing in the Spring/Summer 2016 issue of the NAGC Bulletin. Many thanks for their permission to share it here. A copy of the complete article is available through interlibrary loan from the numerous public and art museum libraries which subscribe to this journal, (including the Rakow Library at The Corning Museum of Glass). The Bulletin can also be obtained directly from its publisher, the National American Glass Club. 2016, by Stephen Boehme, Riverton, Utah. Benjamin Franklin (1706-1790) became famous in his own lifetime as a printer, author, inventor, statesman, diplomat and scientific investigator. The man gracing the hundred-dollar bill has been celebrated for his work in a formidable range of fields, so perhaps we should not be surprised to learn of one that has largely escaped notice. In fact, there is an extraordinary further chapter to be told. 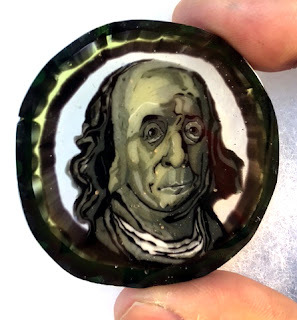 Franklin fostered a lifelong fascination with glass and spent considerable energy in efforts to attract talent from Europe to work in America. Glass and glassmaking garnered not only Franklin’s own enthusiasm, but also that of his family and friends. He worked closely with artisans on two continents and applied his considerable knowledge of glass to areas ranging from music to optics to electrical experimentation. On his European diplomatic missions, he tirelessly encouraged foreign glass workers to set up shop in the colonies. In the decades before America gained independence, he recognized and promoted the vital importance of glassmaking. Unbeknownst to many, Benjamin Franklin played a sustained and influential role in the formation of the American glassmaking industry. His connections to the field were wide ranging; his older, favorite brother, John Franklin, became co-founder of a glass factory in Braintree Massachusetts from the late 1740s to early 1750s. In Philadelphia, Benjamin befriended Thomas Godfrey (1704–1749), a glazier, optician, glass and instrument maker who rented space from Franklin to work on new inventions. Lambert Emerson was another glass related acquaintance and fellow Freemason; an émigré from Dublin who advertised in Franklin’s newspaper The Pennsylvania Gazette as a “looking glass maker at the Sign of the looking Glass in Front Street, Philadelphia.”  Franklin’s neighbor, Caspar Wistar, was a German glassmaker from Cologne. He owned the nearby glassworks at Alloway Creek in Salem County, New Jersey, just twenty miles south of Philadelphia. Besides making windows and bottles, Wistar manufactured special “philosophical” glassware for Franklin, used in his electrical investigations. But Franklin had much more than a passing familiarity with glassmaking. In 1746, he advised Connecticut businessman Thomas Darling on the particulars of running a glass foundry, referring to Wistar’s New Jersey operation. In his correspondence, Franklin consistently referred to his neighbor’s ‘Wistarburgh Glass Manufactory’ as “our glasshouse,” strongly implying a business relationship with Wistar. 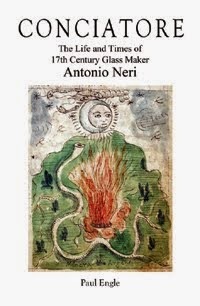 He is credited with several of his own glass inventions. Two popular items that particularly employed glass were bifocal spectacles and his musical armonica. Over his lifetime, Franklin traveled to Europe four times between 1725-75. In London, Paris and on side excursions throughout Europe, he was in frequent contact with glassmakers and he spent considerable effort encouraging them to immigrate to America. He understood the strong potential of a glass industry as an economic driver and as a window to groundbreaking scientific discoveries. Critically, he also understood the value of inviting foreign workers to participate in the American dream. In London, he frequented the Royal Society (of scientific investigators) and was correspondent and houseguest of such luminaries as Joseph Priestly, David Hume and Erasmus Darwin. Glass was a hot topic of discussion in these circles due to the recent development of electrostatic generators and Leyden jars, which all had critical components made of glass. After nearly four decades championing an American glass industry, word seems to have gotten around. Although his responses are not available, glassmakers wrote to Franklin from around Europe. In 1778, he received a letter from French master glassmaker Müller de la Piolotte, who explained his family’s long history in the art, starting with his ancestors in the Black Forest of Germany. The 43-year-old bachelor had worked in Champagny, Burgundy and in the Alsace-Lorrain regions of France. The glass factory in Braintree Massachusetts was founded by Joseph Crell, John Franklin and Peter Etter in the late 1740s. In 1752, others assumed management. See Carla J.Mulford, Benjamin Franklin and the Ends of Empire, Oxford: Oxford Univ. Press, 2015, p. 156. Thanks to Gail Bardhan of the Rakow Research Library of the Corning Museum of Glass for her assistance on this point and many others throughout the article. The Knight of Glin, James Peill, John Rogers, Paul Mellon Centre for Studies in British Art., et al (2007), Irish Furniture, New Haven: Yale Univ. Press, p. 37. For the Freemason reference, see The Pennsylvania Gazette, June 25, 1741. Franklin was the chapter’s grand master by 1734. Letter to Joseph Leacock and Robert Towers from BF, London dated 22 Aug 1772. See The Papers of Benjamin Franklin (1959–) New Haven: Yale Univ. Press, v. 19, p. 282. Also, see http://founders.archives.gov/documents/Franklin/01-19-02-0184. Henry William Stiegel (1729-83) owned three glasshouses, in Lancaster County Pa. See letter from Richard Bache to Franklin, dated 16 May 1772 (Bache was Franklin’s son-in-law). http://founders.archives.gov/documents/Franklin/01-19-02-0100. Letter from sons of Herman Heyman, Bremen to BF, Passay, dated 31 July 1783. Op. cit. Papers of BF, v. 40, p. 143. Letter from Mr. Sutter to BF, Passay, dated 29 October 1783. Op. cit., Papers of BF, v. 41, p. 548. Letter from Herman Heyman Jr., Bremen to BF, Passay, dated 19 January 1784. Op. cit., Papers of BF, v. 41, p. 489–90. Op. Cit., Papers of BF, v. 41, p. 552. Note to Dr. Franklin, from David Rittenhouse, Monday noon [c. 1787]. Op. cit. Papers of BF, (forthcoming). Kevin Keim, Peter Keim, (2007). A Grand Old Flag, a History of the United States through Its Flags. New York, New York: Dorling Kindersley Ltd. p. 43. BF (1736), Poor Richard’s Almanack, Philadelphia, August 1736, (v. 2, p. 141), see https://en.wikiquote.org/wiki/Poor_Richard%27s_Almanack.